Less than four weeks to go now and I’m very, very excited. I was even more excited to arrive home from work to find a package waiting for me at the door from Icebreaker, a sponsor of this trip. What initially started as a small conversation about possibly recieving some assistance with replacement socks has cacsaded into quite the package of goodies. 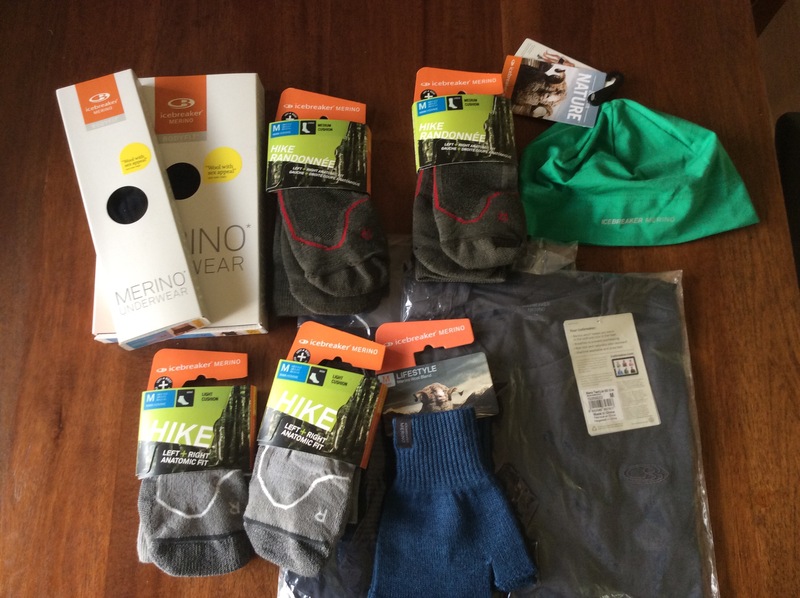 My initial thinking was that with constant wear on the trail I was likely to blow out at least 10 pair of socks along the way, and while I’d start walking with my own purchased Icebreaker socks, baselayers and t-shirts, I would have to replace them at some stage. Straight away Icebreaker were very supportive of my Te Araroa plans and were keen to see their products put through there paces over a long distance with continous use. I’ve been an avid user of Icebreaker merino clothing for years and reckon their products can’t be beat. Soft against the skin, light and breathable, Icebreaker merino is unrivalled for the low stink factor after persistant wear. Warm in the cold and cool in the heat, what more could you want. When you have weeks between a proper shower and a clothes washer Icebreaker socks and base layers keep you comfortable and smelling OK for town. It’s a win-win situation really. Icebreaker is an iconic New Zealand clothing company which goes hand in hand with an iconic New Zealand trail. But nothing is for free right… As an ambassader to the brand I’ll be putting Icebreaker products through their paces and reporting back on things like wear, tear and how long different items are lasting. Plus lots of photos to go along with all this. What better way to do that on on a long distance thru hike on the Te Araroa trail. And just to put it out there….anyone who has used merino products for a while will be aware that the material can wear thin and develop holes right?….Wrong – check out Icebreakers new corespun technology and products, where merino fibres are spun around a nylon core. All the benefits of merino clothing as you know it, only 40% stronger than the industry standard. The future has arrived. Awesome! I would very much like to thank Icebreaker for their sponsorship and proudly promote them.